An external hordeolum is an abscess in one of the sebaceous glands of the eyelid. There are many sebaceous glands in the eyelid. Any of these glands can become involved. When an external hordeolum occurs, there is a painful swelling of the margin of the eyelid. This enlargement is usually localized to one small area. Occasionally, the abscess will enlarge and rupture through the skin. A hordeolum can spread into the adjacent eyelid tissue. When this occurs, the infection can expand dangerously through the tissues. 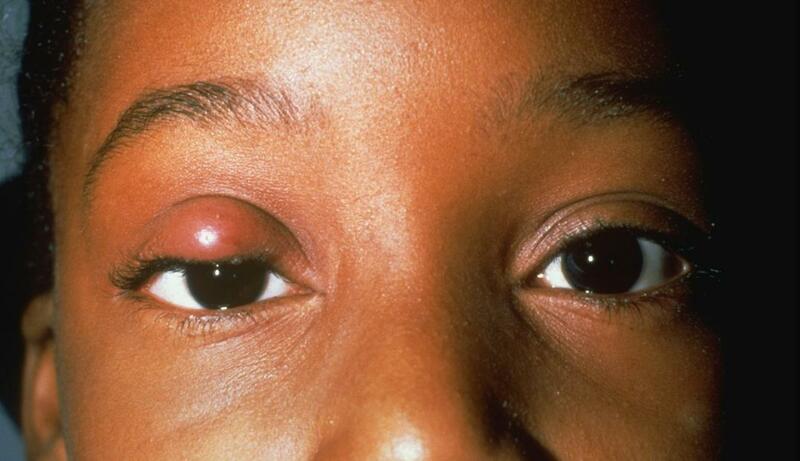 An internal hordeolum is an abscess in one of the meibomian glands of the eyelid. There are many meibomian glands in the eyelid. Any of these glands can be involved with an internal hordeolum. The meibomian gland manufactures oil that flows onto the surface of the eye and is essential for the tear film. When an internal hordeolum occurs, there is a painful swelling of the eyelid. Occasionally, the abscess will grow and rupture through the skin or conjunctiva. 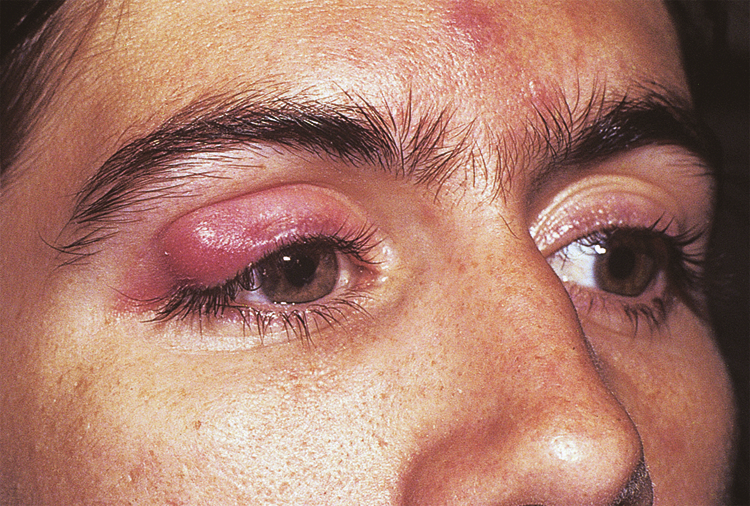 A hordeolum can spread into the adjacent eyelid tissue. When this occurs, the infection can spread dangerously through the tissues. Oral antibiotics are the mainstay therapy. If you see that the area of redness, swelling, and tenderness is enlarging, call the office immediately as you will likely need oral antibiotics. A chalazion manifests itself as a painless swelling of a portion of the eyelid. Generally, it comes on slowly and is characterized by minimal inflammation of the eyelid or the conjunctiva (the inside of the eyelid). Microscopically, a chalazion is a granulomatous reaction against fat from one of the sebaceous glands (external chalazion) or meibomian glands (internal chalazion) of the eyelid. A granulomatous reaction is just a low-grade inflammation. A chalazion generally does not cause discomfort but may become painful if the swelling becomes grows large enough. Many patients can treat a chalazion without surgery. Surgical intervention is available if the medical treatment does not work. Fortunately, the surgical treatment of a chalazion can be performed in the office and requires very little time. Apply heat to the closed eyelids for 10 minutes. The application must be HOT, not warm. Shower water is not hot enough. The purpose is to increase the blood supply to the area and to liquefy the oils in the sebaceous glands. Increasing the blood supply will increase the number of infection-fighting cells that migrate to the affected part. Take care not to burn the skin. Apply firm pressure across the surfaces of the eyelids for 30 seconds immediately after the hot compresses. The application of heated compresses will liquify the waxes in the oil glands. 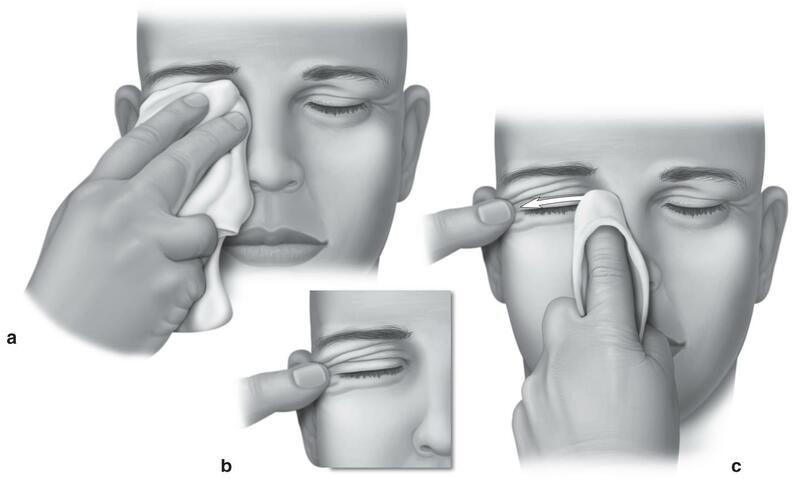 In the liquified state, the patient can express the oil from the meibomian glands by massaging the eyelids. Simple pressure across the entire surface of all four eyelids will force the oils out of the oil glands. Once the eyelids are no longer hot, these oils will, once again, become waxes. Pull your eyelids away from your eyes and scrub the narrow area between your eyelashes and the back of your eyelid with a commercial eyelid scrub (such as OCuSOFT, Sterilid or Systane Lid Wipes). If these products are too expensive for you, you can use Johnson’s Baby Shampoo placed on a damp washcloth. The purpose of the scrubbing is to remove debris and scales from the eyelid gland openings mechanically. The openings of these glands are located at the edge of the eyelid. Gently scrub the eyelids and lashes with the eyes closed. Place a small amount of the antibiotic/steroid ointment on the tip of a cotton-tipped applicator. Rub this ointment onto the narrow area between your eyelashes and the back of your eyelid. The purpose of this antibiotic/steroid ointment is to reduce the number of infecting organisms that are present at the openings to the eyelid glands. When the infection is more widespread, the patient will need to ingest an antibiotic orally as opposed to applying it topically to the eyelid. If you are pregnant, consult your obstetrician before taking the prescribed medication. Use a sunblock. The tetracycline family of drugs can cause a sunburn. If you are currently using birth control pills, please use an additional form of birth control while you are taking the Minocycline or Doxycycline and for two weeks after finishing the antibiotic therapy. Blepharitis is, in part, due to inadequate flow of the meibomian glands. The following will promote proper flow. Take these oils on a daily basis, as indicated on the product. Increase water intake to about one gallon per day for an average individual. If you are a “small” or a “large” person, adjust your dosage accordingly. If you engage in aerobic exercise, increase your dosage accordingly. Barlean’s Total Omega, liquid form only (not soft gels). Liquid Total Omega is available in a flavored form. We strongly recommend the flavored form as it does not have an offensive taste. NOTE #1: Consult with your primary care physician before starting ANY over the counter supplement. There may be a contraindication for a specific supplement. NOTE #2: If the supplement indicates a range of dosages, take the maximum dosage unless you are below average in size which may require a dosage adjustment accordingly.